Oh the magic of slow cooking over low heat. There’s nothing that takes to the caramelisation process better than onions — trust me on this one. This is such a simple process — and it requires time but little effort. It’s the perfect thing to have going on the stove when you’re cooking something else and can check in every so often (see how technical that is) for a little stir. Once you’ve got caramelised onions on hand (and they keep really well in the fridge for about a week) you have a whole new deep & rich flavour for quickly spicing up your meals. Try them on a sandwich (maybe in place of these roasted onions in a Roasted Portobello & Onion Sandwich with Blue Cheese), or to make your favourite pasta dish explode with caramelised goodness. They’re amazing in calzones and on pizzas, and I bet you could make awesome wonton ravioli with caramelised onions as either the filling or the sauce. But the best way I like them? On toasted bread. Like a spread. But smellier. Oh yeah. Each onion will yield only about 1/4 of its fresh size in caramelised form, 3-4 onions yield about 1 cup once caramelised. 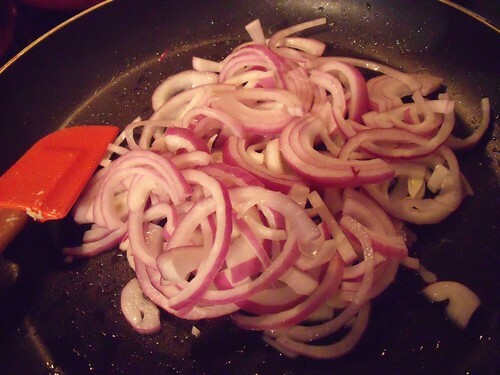 Over very low heat in a very large pan, sweat the onions in the oil until they become translucent. Then keep going. Don’t try to cheat and turn the heat up, you need to keep the heat low and the process slow to get the best flavour. Keep the onions on the heat for about 45-60 minutes total, stirring occasionally. I find that as the onions reduce down in size, they cook best when you smush them all together into the centre of the pan. When they are all browned and sweet and delicious (after about 45-60 minutes), remove from heat and stir in the salt. Enjoy with friends, so you’re not the only stinky one! 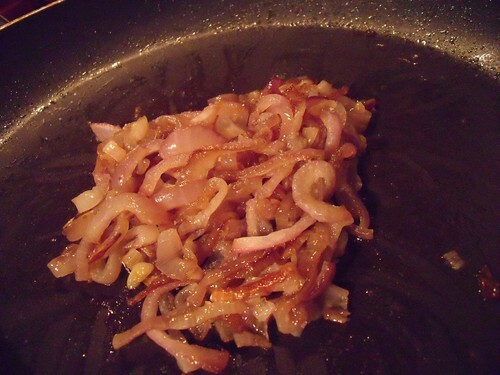 I’m so ashamed that I used to turn my nose up at onion, no matter how lovingly caramelized…all those wasted years! This looks amazing Lindsay, as always! I never take the time to do this but I will from now on. 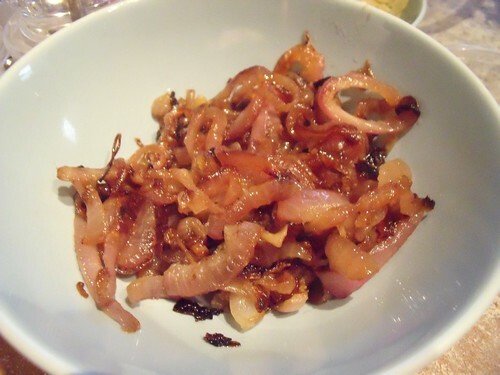 I ate caramelised onions at a restaurant that really knew how to do them well and they were so delicious I swore I’d learn how to propersly caramelize onions! No more cheating for me! I find it’s one of those perfect things to have on the stove while you get other stuff done. And they are AWESOME on pizza.